With today’s complex, heightened economic environment, you need effective, efficient reconciliation processing. Electra Reconciliation, formerly known as OpenSTaARS, enables efficient operations by automating the identification of exceptions and by providing greater visibility into the exception management process. 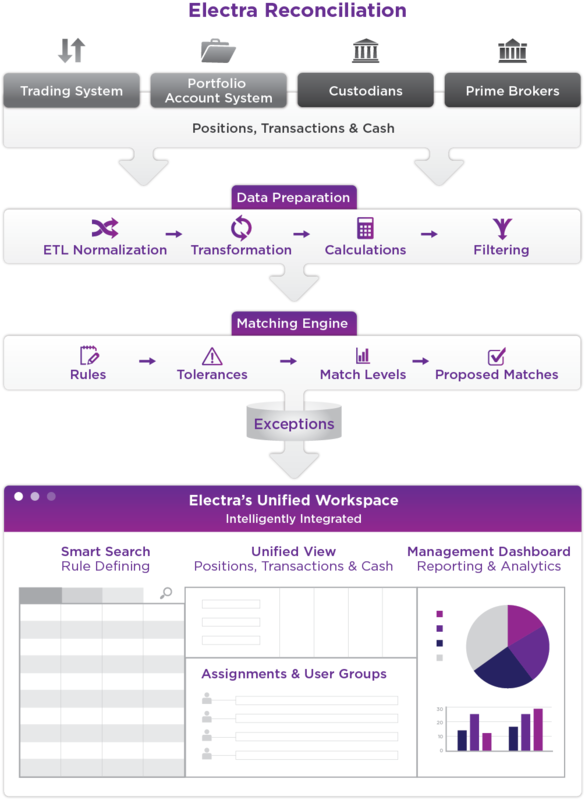 An innovative and intuitive platform – which can be installed on-site, delivered via SaaS and provided as a hosted and managed service, as well as offered as a scalable solution for startups to meet any of your firm’s specific needs – Electra Reconciliation provides an integrated and consolidated view of your positions, transactions and cash. Electra Reconciliation is a flexible tool that monitors and resolves exceptions based on your specific rules. In addition to supporting standard custodial reconciliation of positions and transactions for all security types across multiple systems and parties, Electra Reconciliation supports a wide variety of additional reconciliation activities such as system to system, P&L, collateral, security master, pricing and many others. Electra Reconciliation is designed to automate reconciliation processes that have been historically handled manually or by outdated solutions that do not reduce overhead costs and associated operational risks. You will now have the flexibility to concentrate on what’s really important – your business. To request a demo on Electra Reconciliation, please click here.